← 182 "Treehouse of Horror VIII"
The couch is full of water. The Simpsons run around screaming, as their butts are on fire. They sit, and sigh. "Everyone is tired of that Richard Gere story"
The Cartridge Family is the fifth episode of Season 9. It first aired on November 2, 1997. The episode was written by John Swartzwelder and directed by Pete Michels. "After a wild soccer riot tears up Springfield, Homer purchases a handgun to protect his family. But when Marge's repeated requests to dispose of the weapon go without notice, she whisks herself and the kids away to a seedy motel." The Simpsons attend a soccer match between Mexico and Portugal. When the game starts, the crowd begins to lose interest and it turns into a violent soccer riot. Eventually the riot escalates and spreads all over Springfield, forcing mob rule to be installed. Homer does not want to pay $500 for a Home Security System and decides to buy a firearm. After the five day waiting period, Homer surprises Marge with his new revolver. She is horrified and appalled, demanding that he get rid of the gun at once. Homer persuades Marge to come with him to the local National Rifle Association ("Come in and shoot your mouth off.") meeting to try and get her to change her mind. After the meeting, she still remains unconvinced. Homer treats the gun as though it were a toy, casually carrying it into the Kwik-E-Mart, firing bullets to retrieve items from the roof and shooting dinner plates as if they were clay pigeons. Finally, after a near fatal accident at the dinner table, Marge reveals just how uncomfortable with the gun she is, begging Homer to get rid of it. Homer promises to do so, but hides it in the vegetable crisper instead. Later, Bart and Milhouse discover it and play William Tell in the kitchen. Marge steps into the kitchen just in time to stop them, and rounds on Homer for breaking his promise. She then gives Homer an ultimatum: "Until you decide what's more important, your gun or your family, we can't live in the same house!" After that she promptly leaves with some suitcases and the children in tow. That night, Homer hosts an NRA meeting at his house but his reckless gun usage appalls the other members and he is kicked out of the association, and the house until the meeting was over. Realizing what his gun has cost him, Homer goes to the Sleep-Eazy Motel where Marge and the kids are spending the night, meaning to reconcile. Homer and Marge make up, after Homer explains he has finally gotten rid of the gun. While leaving, Snake arrives to rob the desk clerk, demanding the cash register's contents while holding a knife to Mayor Quimby's throat. Homer pulls out his gun and foils the robbery. Marge is angry at Homer for lying again, but whilst he's apologizing to her, Snake snatches the gun. The other NRA members arrive and stop Snake from shooting, but he runs off with the money all the same. While Marge is about to throw the gun away, she sees her reflection in the trash can lid. She is convinced that a gun makes her look cool and decides to keep it. This was the first episode to be executive produced by Mike Scully. Sam Simon pitched an episode for one of the first seasons which saw Homer getting a gun and nobody wanting him to have it. The episode concluded with Homer foiling a robbery and stating that although guns bring destruction, it worked for him. However, this episode was pitched by Scully for either season seven or eight, before being used for season nine. This provided the basic outline, and John Swartzwelder wrote the script. A lot of lines in the episode put guns in a positive light, as the staff felt that they could not just make an episode about how bad they were. Several of the staff are "pro gun" although others, such as Matt Groening, are very left wing and completely against them. That said, the episode is non-bias and does portray each side of the argument equally. The censors were nervous about some of the episode's subject matter, such as Homer pointing the gun in Marge's face, and Bart aiming the gun at Milhouse with the apple in his mouth, but ultimately let it go. The opening sequence where soccer is portrayed as the most boring sport imaginable was intended to show that soccer was more boring on television than live, but both he and Groening enjoy the game. The referee at the game is a caricature of the janitor at Film Roman, who supplied director Pete Michels with every piece of soccer information he needed to design the episode. Pelé also makes an appearance at the match, although is voiced by Hank Azaria. The episode closes with music from The Avengers. After the music had been recorded Scully felt that it did not suit the ending and so wished to change it to something else. However, it was too late in production to get the full orchestra back to do a recording, and union rules meant that previous recordings could not be reused. The episode received several positive reviews, being included in the Herald Sun's list of the top twenty The Simpsons episodes. It was also named the fifth best episode in the show's history in an article by The Florida Times-Union. The Pittsburgh Post-Gazette also praised the episode, calling The Simpsons "the only sitcom in memory to treat gun control with any fairness." On the other hand, the episode has been criticized by several outlets. 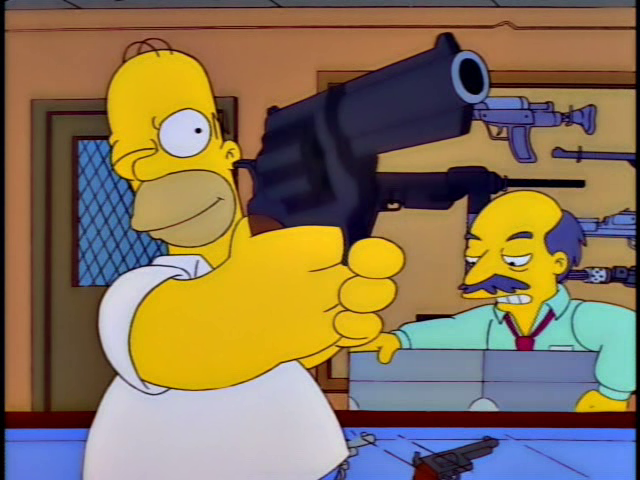 The staff received several complaints from the NRA about the portrayal of the organization in the episode, despite the fact that they take Homer's gun away from him when they see his irresponsible behavior. Ian Jones and Steve Williams criticized the episode, calling it "a messy, unfocused lampooning of gun culture." Warren Martyn and Adrian Wood, the authors of the book I Can't Believe It's a Bigger and Better Updated Unofficial Simpsons Guide found that it was "one of the most politically unambiguous episodes ever," but that "[it] is very dull and the plot isn't sustainable." The episode was banned from the United Kingdom satellite channel Sky One due to scenes of flagrant gun misuse, yet was aired several times on the free channel BBC Two in an earlier evening timeslot. The episode was also included on the Too Hot for TV VHS and DVD, along with "Treehouse of Horror IX", "Natural Born Kissers" and "Grampa vs. Sexual Inadequacy". ↑ 1.0 1.1 1.2 1.3 1.4 1.5 1.6 1.7 1.8 Scully, Mike. (2006). The Simpsons The Complete Ninth Season DVD commentary for the episode "The Cartridge Family" [DVD]. 20th Century Fox. ↑ Meyer, George. (2006). The Simpsons The Complete Ninth Season DVD commentary for the episode "The Cartridge Family" [DVD]. 20th Century Fox. ↑ 3.0 3.1 Groening, Matt. (2006). The Simpsons The Complete Ninth Season DVD commentary for the episode "The Cartridge Family" [DVD]. 20th Century Fox. ↑ 4.0 4.1 Michels, Pete. (2006). The Simpsons The Complete Ninth Season DVD commentary for the episode "The Cartridge Family" [DVD]. 20th Century Fox. ↑ "The Simpsons Top 20". Herald Sun. April 21, 2007. pg. w09. ↑ Nancy McAlister. "A sassy 'SIMPSONS' celebration; Fox hits a Homer as it broadcasts the 300th episode of the animated sitcom tonight". The Florida Times Union. February 16, 2003. pg. D1. ↑ Jonah Goldberg. "The Simpsons: Bedrock American Values". Pittsburgh Post-Gazette. May 14, 2000. pg. E1. ↑ Ian Jones, Steve Williams. NOW LET US NEVER SPEAK OF IT AGAIN. Off The Telly. Retrieved on 2007-08-14. ↑ Warren Martyn; Adrian Wood (2000). The Cartridge Family. BBC. Retrieved on 2007-06-12. ↑ Steve Williams, Ian Jones. THAT IS SO 1991!. Off The Telly. Retrieved on 2007-08-14. ↑ The Simpsons: Too Hot for TV. Fox. Retrieved on 2007-10-25. Wikisimpsons has a collection of images related to "The Cartridge Family".